It's awesome to have mastered vinaigrette. I bring this up because vinaigrette is the first thing I make for my pasta salads, which I will be talking about soon. The proportions of a classic vinaigrette are one part vinegar to three parts oil, but I make mine with three parts vinegar to four parts oil. I worked this out years ago, when lowfat diets were in. Now I don't care about low fat, but I'm used to the taste. I guess it's on the sharp side. It's the most vinegar that oil can hold in an emulsion; so also if you use more acidic ingredients like citrus juices, you have to cut back the proportion a bit. Different vinegars and different oils make different vinaigrettes. I use white wine vinegar, red wine vinegar, cider vinegar, and rice vinegar, and also lemon, lime, and orange juice, and olive oil, and sometimes sesame oil. Measure the vinegar into a bowl. Add salt and pepper, and also any herbs or spices that you may want to use. 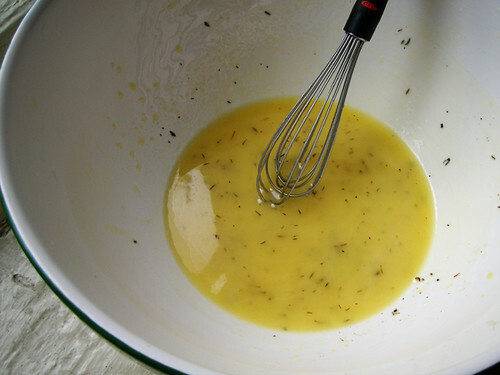 Drizzle the olive oil over the vinegar and whisk it in. If it thickens to the consistency of beaten egg yolk, that's right. If not, you can add a teaspoon or so or mustard, or honey, or mustard and honey, to set it back up.